I often get the question: “Do people get extra teeth?” They do all the time! I love extra teeth and talking about them and secretly wish I had one myself. The most common extra tooth is to have an extra wisdom tooth, which generally is removed when your wisdom teeth are removed. 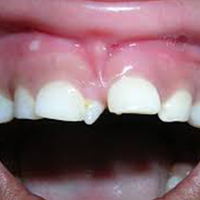 The second most common is to have an extra front tooth between your two front teeth called a Mesiodens, which looks like a small vampire tooth. These can cause real problems in the proper growth and development of the adult teeth. One of my favorite procedures is removing a Mesiodens from the roof of the mouth. This generally requires an incision and some bone removal from the palate before they come out. The coolest is when they actually are growing upside down toward the nose instead of the mouth. If you are lucky enough to have a Mesiodens the tooth fairy pays extra for them…at least that’s what I hear.